We're totally over Instagram and bloggers with their virtual barrage of food about to be eaten. I know my hat is right there in that ring too, yes. Which is what makes the naive illustrations of the Tumblr account Good Food Crap Drawing so divine and refreshing. There's no sorting through selfies to get there, no shiny plates, no bad flash, no irritated other diners, and no poor chef out back unaware the food they've prepared is being photographed and distributed to 60,000 odd unique users a month. 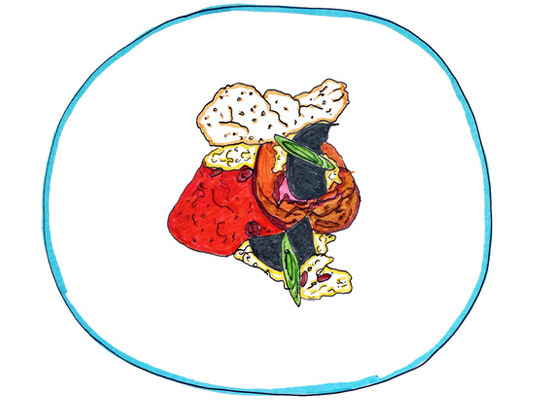 The illustrator travels from Brooklyn and Sydney, visiting some of the top and most interesting restaurants in between. 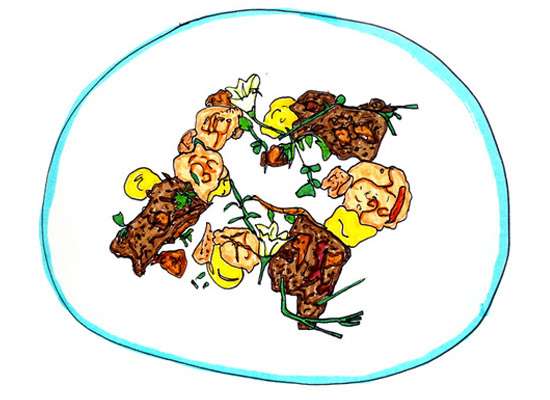 Dishes from Hartsyard and Mr Wong in Sydney, Vue de Monde in Melbourne (top: Greenvale farm pork, marron, wild herb cream), Attica and the former Lotus (bottom: Dan Hong's burger - HERE) appear on the simple site, with illustration and minimal explanation about the drawn dish. There's the salt cod, green peas, mint vinaigrette and pea shoots being served right now in Brent Savage's Monopole (above), and many more. Click here for more. Somehow, with the constant delivery of photographed food, the concept of drawing, with actual ink, seems very modern and new. From top to bottom: 1. Vue de Monde's Greenvale farm pork, marron, wild herb cream; 2. Monopole's salt cod, green peas, mint vinaigrette and pea shoots; 3. The Apollo's walnuts, sorrel, currants, pomegranate, farro; 4. Red braised pig’s head, stir fried milk, red pepper and white sesame, Hervey Bay scallop and candied pine nuts from Rockpool on George; 5. Dan Hong's burger from Lotus. 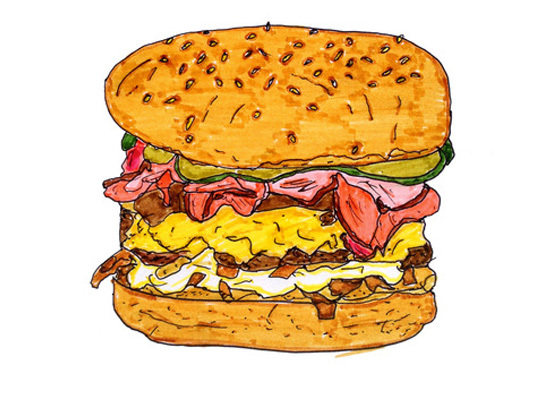 See more illustrations from Good Food Crap Drawing.